In corporate aviation, a good Chief Pilot is a strong team leader in a technically-oriented world. A great Chief Pilot sets a clear direction and is aligned with the entire aviation leadership team: Director of Aviation, Director of Maintenance, the Scheduling/Dispatch Manager and Business Manager. In today’s workplace, more than half (53%) of workers describe themselves as “not engaged,” according to a recent Gallup Poll. And another 13% are “actively disengaged.” That means they’re not really putting their hearts into their jobs—they’re showing up, putting in the work, and going home. If they get a better job offer, they’re probably leaving. A successful company needs employees who are on board with and aligned with your company’s greater purpose. As Chief Pilots, how can we create a cadre of pilots who not only want to be there, but who show up to work with enthusiasm and dedication? Significant real world experience as a line pilot helps a Chief Pilot build empathy. Working with direct reports to continually move them forward is step number one. Getting the resources necessary to ensure the current and future success of the flight operations team is the next step. Your line pilots will definitely appreciate it when you have a great relationship with the Aviation Director (and higher within the company), and continually go to bat to get what they need to succeed. As a Chief Pilot, you must also proactively stay out ahead of technology and trends in aviation. Fairness, prioritizing “the greater good” and keeping pilots motivated is also essential to building a great cadre of pilots. Staying crystal clear on both the host company’s and the aviation organization’s mission, vision, and values are can help. Why are you doing this work, and how is the world going to be a better place because of it? As a member of the aviation organization’s senior leadership team, you must understand and be able to communicate with each of the aviation organization’s functional areas. You must also embrace the host organization’s direction and key objectives. When you’re clear on all of these things, you can ask your direct reports to commit to and align with them. Take time to clarify all of these objectives, and work to resolve any inconsistencies. The more you can help pilots see how what they’re doing matters, the more they’ll feel committed to their roles. Make sure your corporate culture lives up to its claims. If part of your mission statement is that talent will be promoted from within – but every time a senior position opens up, you go outside to find talent – you’re going to have trouble with pilot retention. If an employee demonstrates commitment to your company’s values, they should be rewarded. Penalties must be uniformly enforced for violating company policy, no matter how successful the person is. Build an employee’s commitment to the company’s mission into your performance review process. A commitment to helping others develop to their full potential means sharing your time and expertise. A great Chief Pilot is highly knowledgeable, while always demonstrating openness to new ideas brought in by the team. A great Chief Pilot communicates well with maintenance, scheduling, dispatch and business management, keeping everyone in the loop and open to questions and constructive criticism. Looking to Build a Great Team of Pilots? Pilot turnover is on a lot of our Employers’ minds right now. 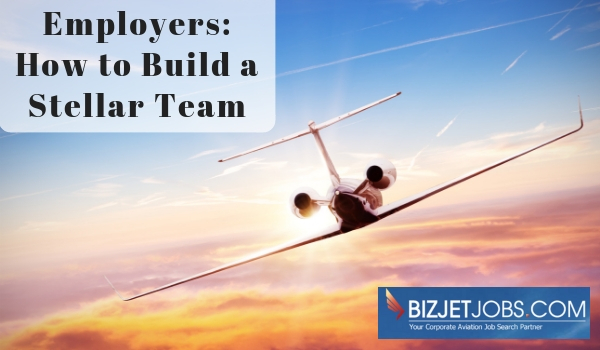 At BizJetJobs.com, our staff of industry experts and friends has become a family eager to help continue the journey for our corporate pilot and corporate aviation employer members. We are available by phone and email to answer questions. Employers, register here to search our qualified Pilots by Type Rating / Aircraft, find Contract / Part Time Pilots or search Pilots by Location Worldwide on BizJetJobs.com, home of the most qualified and current corporate pilots ready to work now. Also see our previous post, 10 Tips: How to Post a Winning Pilot Job. Call BizJetJobs.com to speak with a Corporate Aviation Staffing Specialist and ask for help fleshing out your job post. Let us help you find the right pilot today! This entry was posted in Aviation Staffing, Blog, Employer by Amanda Jenkins. Bookmark the permalink.